The Saskatchewan Real Estate Commission (Commission) is the regulatory body that registers individuals to trade in real estate upon successful completion of the applicable education course(s). The Commission’s mandate is to protect the public and the reputation of the profession. One of the requirements for initial registration is a Certified Criminal Record Check (CCRC) by fingerprint comparison. This process verifies whether an individual has a criminal record and provides the requesting agency with the detailed information that can be legally disclosed. The Commission deems that a CCRC is a fingerprint comparison of an applicant’s fingerprints obtained under The Identification of Criminals Act. Effective July 1, 2014, the Canadian Criminal Real Time Identification Services will ONLY accept electronic fingerprint submissions for civil purposes. This new process aims at improving the service levels and accuracy of your screening. The following services are accredited to take and submit your fingerprints electronically; however, it is recommended to contact them in advance to confirm a staff person will be available for the service you require. Note: All accredited agencies offer a variety of criminal record checks and some of these options are available through an online application. To be clear, NONE of these are an acceptable substitute for a CCRC. 1. If you have concerns of known results which will appear on your CCRC prior to purchasing any educational materials, please contact Registration at the Commission office so we may discuss and address those concerns. 3. When instructed to do so through the License Reciprocity process. 1. Call ahead to the approved service to see if you need to make an appointment. Depending on where you reside you may be re-directed to another agency. 2. There may be a fee associated with the service; confirm the amount and how they accept payment so you are prepared for your appointment. 3. You will be required to provide two pieces of Government issued ID - one of which must be a valid photo and both pieces of ID must be in the same last name. 4. 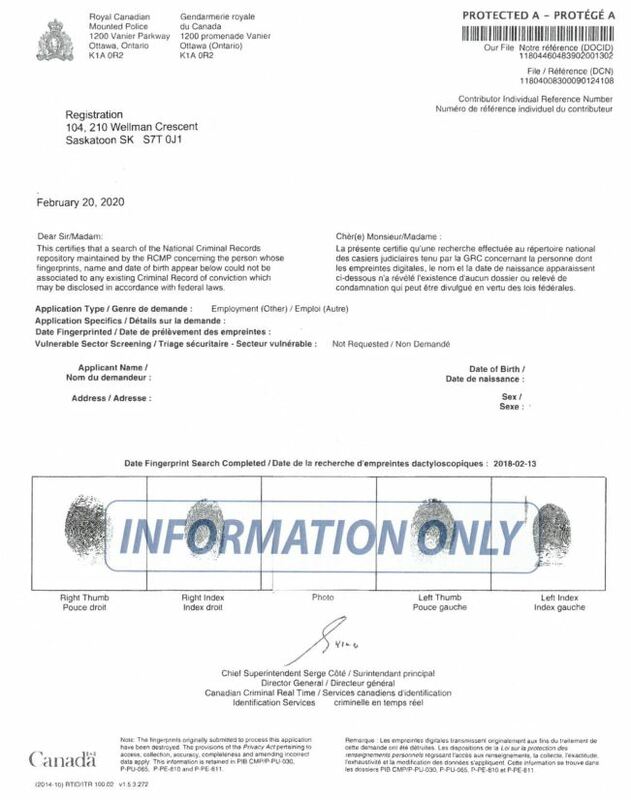 Clearly state the reason for your certified criminal record check by fingerprint comparison for employment with the Saskatchewan Real Estate Commission (Commission). You do not need the Vulnerability Check. 5. Fully complete the application form making certain to complete the third party section to ensure the results will be sent directly to the attention of Registration at the Saskatchewan Real Estate Commission office, 237 Robin Cres, Saskatoon SK S7L 6M8. 6. Your fingerprints will be taken and together with the application will be forwarded electronically to the RCMP detachment in Ottawa, Ontario for processing. 7. Once the application has been submitted and depending on the service provider you used, you may receive a phone number and/or email address for follow up on the status of your application. Most agencies instruct applicants to allow 120 days for processing so it is important to wait until after the estimated processing time has passed before contacting the agency for following up. c. Since the results are a certified document, the results are sent via regular mail and extra time should be allowed for delivery by Canada Post. Note: If you inadvertently receive the results directly - please contact the Registration person at the Commission office immediately. The Commission does not offer conditional registration so all original documentation must be received, reviewed and accepted by the Commission prior to being eligible for registration.